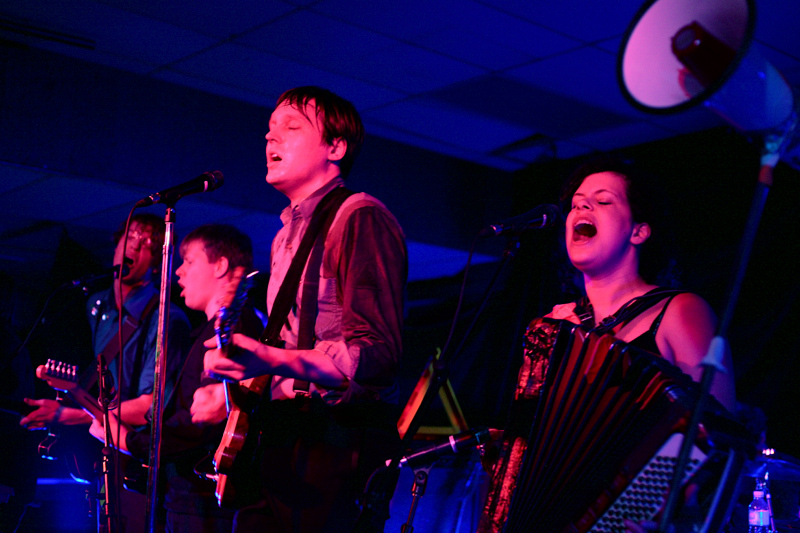 The Arcade Fire played a low-key show at Richard's old stomping grounds - Canterbury High School in Ottawa - as a benefit for Canterbury Arts Centre Development Association (CACDA) a charitable organization that raises arts funding for the school. I was lucky enough to be asked to help produce the show and had to bring my camera to document the event. Their eleven song set previewed the majority Neon Bible kicked off with the record's lead off track "Black Mirror" and encoring with "Power Out". I am sure there were a few glitches here and there but I was having too much fun to notice as were the 530 students, alumni and CACDA members in attendance. My punk rock promoter spidey sense started tingling when kids started crowdsurfing as "Rebellion (Lies)" kicked in, but it was pretty chilled and didn't get out of hand and there wasn't a mob of people outside trying to get in, just a kid flashing some $20s at the window at the begining of the night and a few kids dancing outside the open back door to the cafeteria. Thanx to the band, former teacher Jim McNabb, principal Frank Wiley, Wall Sound and everyone else who was involved for making this a truely awesome evening. There's an exclusive live video of "Intervention" from the show at Pitchforkmedia as well as pre-order links and a more qualified review forthcoming.